My training for the Miami Half Marathon has officially started. Yesterday, I ran five miles in the dark. I don’t like winter, can we please have daylight savings time back? I have a 15k race on Saturday, the Teddy C 15k (Ted Corbitt 15k) in Central Park. I figure if I give the race a lovely nickname that will improve my chances of getting close to a PR. Chicken Twins! You see that one lonely yoke on the other side? He wants to be friends with the twins. More importantly, this past week has been a bounty of chicken twins. By chicken twins I mean the more appropriate term of double yokes in my jumbo organic eggs from FreshDirect. But I like calling them chicken twins better. 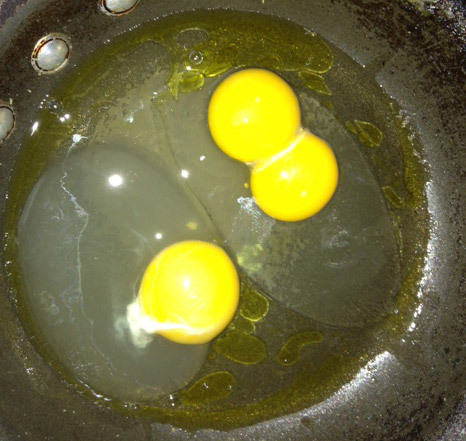 Any way, the chances of getting chicken twins in your dozen eggs is rare, at least in my life it is. I have a call in to Martha Stewart to find out some real facts but so far in this dozen eggs all but three egss have been chicken twins. What are the chances of that happening!?! It’s like I’m getting two eggs for the price of one. What a wonderful yokey bounty! I hoping that I’ll have some chicken twins left for Saturday morning at that they give me amazing power for the Teddy C 15k. This entry was posted in Half Marathons, running and tagged chickens, eggs, half marathon, ING Miami Half Marathon, Martha Stweart, miami, NYRR, twins, vegans. Bookmark the permalink.